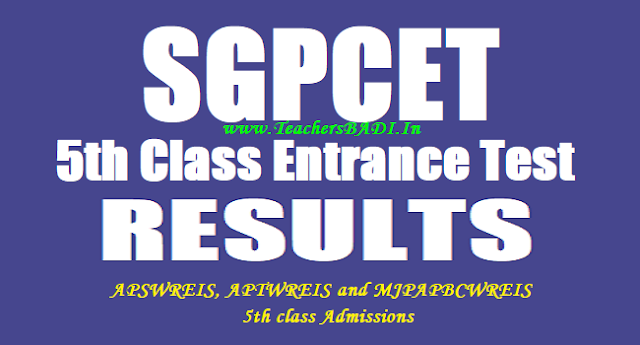 APGPCET APTWREIS 5th class entrance test 2018 results, APTWREIS APGPCET 5th Class Entrance test results 2018, APGPCET APTWREIS 5th class admission test 2018 results, APGPCET AP SC Gurkulam 5th class entrance exam results 2018, AP Social Welfare 5th Class entrance test results 2018, APGPCET FIFACAT Fifth Class Admission test results 2018. APGPCET School Wise Provisional List/APSWREIS, APTWREIS and MJPAPBCWREIS APGPCET 5th class entrance test results 2018: AP Social Welfare Residential Educational Institutions Society issued the APGPCET 5th class entrance exam 2018 notification in February and Online applications were invited from the eligible students from March 23 to April 12 for admission into Class V in all APSWR Educational Institutions, AP Tribal Welfare Residential Educational Institutions and MJPAP Backward Classes Welfare Residential Educational Institutions across the State. APGPCET 5th class admission test was held o April 08 and APGPCET Students are waiting for their results. APSWREIS officials are going to release APGPCET 5th class entrance exam results in this month. 1. Preparation of merit lists. 2. Issue of merit list by Gurukulam. 3. Dispatching of call letters to candidates for counseling. 4. Date of counseling to be conducted by the Principals SOEs/COEs concerned. School Wise Provisional Selection List For Common Entrance Test for Admission into 5th Class for the academic year 2018-18 (in TREIS, TSWREIS, TTWREIS, MJPTBCWREIS) in 21st Century Schools. 4. In this School Wise Provisional List page, candidate should select the District and Select school from the drop down menu, which was option given by you at the time application process.